Adventure into a land cloaked of mystery. Discover the old Fourwell’s history and beware the mysterious shrines which stay untouched from ages, hidden in the outskirts of the town. Meet the Fourwell’s inhabitants and, if you dare, enter the dungeon of the House Under the Hill, a ghostly place said to be haunted. 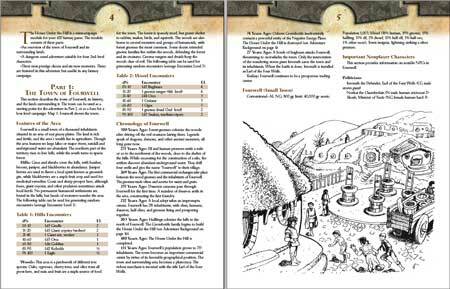 The House Under the Hill is a minicampaign module for your d20 fantasy game. 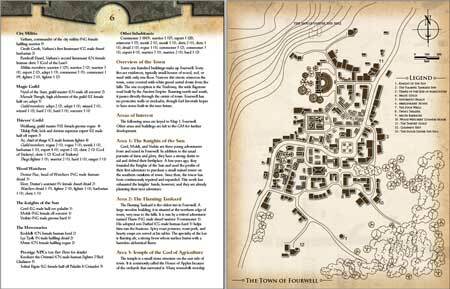 •An overview of the town of Fourwell and its surrounding lands, with detailed locations and maps. 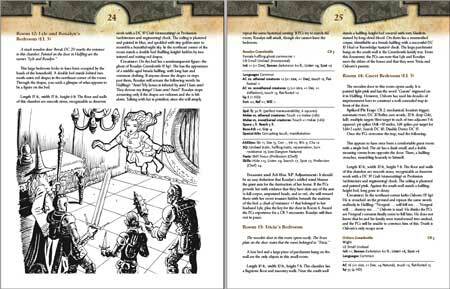 •A small dungeon crawl adventure suitable for four 2nd-level characters. Some one hundred buildings make up Fourwell. Forty-five are residences, typically small houses of wood, sod, or mud with only one floor. Narrow dirt streets crisscross the town, some covered with white gravel carted down from the hills. The one exception is the Tradeway, the wide flagstone road built by the Ancient Empire. Running north and south, it passes directly through the center of town. Fourwell has no protective walls or stockades, though Earl Invorath hopes to have some built in the near future. What happens when a family of noble halflings is turned to horrid undead and their labyrinthine house becomes a dungeon? In the Dungeon Under the Hill adventure, the PCs will face vicious vermin, undead monstrosities, exploding mushrooms, a hysterical ghost, and more. In the end, the halflings’ ancient treasure beckons—if the party can survive to claim it. gned to be more than just a o ..